The shopping period right after Thanksgiving is prime time for leaving cell phones in taxi cabs. Over 30,000 mobile phones are left in New York taxis every six months – but the build-up to Thanksgiving and holiday period are the worst times. According to the regular taxi survey by Credant Technologies, New Yorkers forget on average of 5,000 mobile phones a month in taxis, and more than 500 other handheld devices, including iPods, laptops and memory sticks. And then of course there rain coats, umbrellas, purses, sandwiches, wallets, and on into the night. Other items cabbies have found left behind are diamonds, a baby, a sawed-off shotgun, 12 dead pheasants, two dogs ,one cat, several toilet seats and funeral urns. Wait, we’re not through yet: There was also $5000 in cash, several sets of false teeth, artificial limbs, pork chops and a bra. This could be good material for a feature story. Ya think? 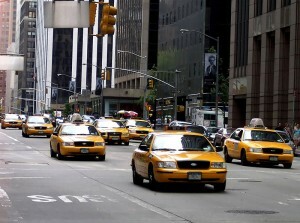 I have recently launched http://www.nyctaxifinder.com with my friend. It was born out of a need to find lost items in taxi cabs. All you do is enter the taxi medallion number and voila, a wealth of information about your cab. It is free!